Pat Buchanan, Suicide of a Superpower (New York: Thomas Dunne, 2011, 496pp.). Pat Buchanan takes the gloves off in his new book. The sentiment captures the sweeping transformation of American society since the mid-1960s — a society that was largely European (in values, population, culture, and folkways) now is on a demographic trajectory to become a majority-minority cesspool by 2050 with the White population declining to minority status. An apt description of American society isn’t merely the metaphorical “salad bowl” replacing the “melting pot” — the lettuce is a vanishing ingredient! The quintessential dilemma that seems to be on the minds of more and more Middle Americans is the question Pat Buchanan poses in the preface of his latest book: “What happened to the country we grew up in?” It is a question weighing heavily on the minds of Midwesterners and other citizens as they see their communities rapidly becoming Third World sinkholes. 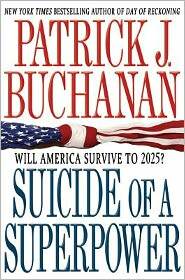 The question is one that preoccupies Buchanan in Suicide of a Superpower. It is indisputably his boldest and most passionate assessment of our nation’s fate — an America vanishing before our eyes. As Buchanan notes, the nation of our forefathers will be unrecognizable to future generations of Americans. It is, as he puts it, a country that lost a nation. It was never the “diverse” multiethnic, multicultural bastion that educators dogmatically promote in our schools. We had, until the early to mid-60s, a nation that was second to none in education, productivity, living standards, and civility. Many homeowners lived in communities that were so safe they never felt the need to secure their doors or windows with locks. The nation was unified culturally, racially, and socially in a majority populace that had deep ancestral ties to the colonial period. The U.S. is in decline by numerous indicators: religiously, culturally, politically, and racially. Buchanan puts forth his case in no uncertain terms. It is a book that will generate a storm of criticism from neoconservative and liberal elites. It most certainly will send Chris Matthews into a vein-popping, spitting tirade on-air should he interview his fellow MSNBC colleague. Buchanan once again dares to go where other “conservative” authors fear to tread. He addresses larger issues that the Right has abandoned for politically correct salaried careers. In fact Buchanan dedicates his eleventh book “To the Old Right.” Most nationally known conservatives will avoid tackling controversial issues that are considered career-ending endeavors: ethnic and racial double-standards that negatively impact Whites as a group, a destructive neoconservative foreign policy, IQ and racial inequalities of cognitive abilities, and the devastating cultural impact of a growing mass of unassimilable immigrants. Buchanan confronts these and related national issues in a sensible matter-of-fact tone. “Religion, race, culture, and tribe are the four horsemen of the coming apocalypse,” writes Buchanan in explaining the significance of ethnonationalism as a political force. This is precisely what Buchanan finds so alarming. This episode is astonishing. Here was a president of the United States telling a largely white student body the day is coming when their own kind will cease to be the majority in a country where the majority rules. Most peoples would sit in stunned silence at such a revelation, or rise in rage at the prospect. The Portland State students cheered the news of the coming minority status to which they and their children have been consigned by their government. Imagine a Mexican president or Japanese prime minister lecturing to Mexican or Japanese college students and telling them they should welcome their coming minority status in their own nation. Would they greet the news with such enthusiastic zeal? On the issue of religious decline — the “Crisis of Catholicism” and “the Death of Christian America” — Buchanan also finds that “demography is destiny.” Third World populations are replacing the dwindling percentage of European, North American, and Australian peoples in church pews and Buchanan clearly sees this as a detrimental trend to upholding the customs and long-standing traditions of Protestant and Roman Catholic faiths. So what are Buchanan’s solutions to reverse what he sees as a prolonged national threat — the multicultural, multiethnic egalitarian utopia that now defines America? For one, downsizing the federal government. In this he puts forth reasonable but arguably light recommendations: setting a moratorium on federal hiring once federal bureaucrats retire, closing down the U.S. Commission on Civil Rights (why not abolish every affirmative action office and civil rights division throughout the federal bureaucracy? ), no bailouts of state governments, halting foreign aid “unrelated to national security,” Cost of Living Adjustment (COLA) freezes for Social Security recipients, balancing future budgets, increasing tariffs on imported goods, ending the National Endowment for the Arts, and Corporation for Public Broadcasting. How about closing down the Department of Education and phasing out entire departments in addition to closing down outdated overseas military bases? Second, in terms of immigration policy Buchanan would impose a moratorium on new immigrants “until employment falls to 6 percent,” give preference to immigrants seeking entry into the U.S. from English-speaking countries or traditionally Western nations (“we need more taxpayers and fewer tax consumers”), complete the border fence, no more amnesties, nudge Congress to amend the Fourteenth Amendment so that it removes the “anchor baby” interpretation, unleash the authorities to take high-profile raids and punish businesses who employ illegal aliens, and establish English as the official language. Third, in terms of reversing our demographic decline as a European-majority nation (in culture, heritage and peoples) Buchanan believes a renewal of traditional Christian faith and reinvestment in the traditional family, particularly a culture that protects life and promotes the desire to raise children (over material wellbeing) could serve as a catalyst for reversing dysgenic birthrates. The irony is that the primary goal of the eugenics movement was to ensure the prosperity of future generations by encouraging healthy and intelligent families to have more children (e.g., with the establishment of “fitter family” contests) and to make sure inherited diseases are eliminated from future generations. Darwinian natural selection and Christian liturgy should work hand-in-glove complementing one another on mutual goals in this much-needed cultural and ethnic transformation. Whatever flaws Buchanan may have on selected points, his overall assessment of the symptoms of our national decline and his policy recommendations are dead on the mark. One suspects that the children of the ethnomasochistic Whites who are eagerly cheering their non-majority status will be horrified when they find what the new America actually holds for them. Of Buchanan’s three areas of policy recommendations, immigration is particularly important, since limited government and a revival of White families will certainly not save White America unless the tsunami of immigration of the last 40 years is reversed. As a result of their declining political power (e.g., as indicated by the impending doom of the Republican Party), Whites will not be in a position to thwart the demands by the new Americans, the great majority of whom have low IQ and very limited educational potential, for high levels of government benefits and services—paid for ultimately by Whites. Nor are Whites likely to win a breeding war with non-Whites even if there was a revival of high-fertility White families. Moreover, although he has avoided some important issues related to the causes of the phenomena he so accurately describes (e.g., the role of Jews as a wealthy, media-dominant elite hostile to traditional White Americans and their culture), it is particularly encouraging that he has explicitly affirmed race realism in IQ and educability and that he has resurrected important intellectuals from early in the 20th century who have been reviled as the epitome of evil as a result of the triumph of several Jewish intellectual movements in the academic world and in the media. Reestablishing the intellectual zeitgeist of that period would be a hugely important accomplishment. This was the period, after all, when America rejected non-White immigration and opted for the ethnic status quo favoring Europeans by enacting the Immigration Act of 1924. Unfortunately, the ideology of White suicide is deeply entrenched in all of the critical centers of power in the United States—the media, the academic world, big business, and the political class. Unraveling this daunting infrastructure is a challenging proposition indeed. The author, a freelance writer, can be reached at cooper.sterling63@gmail.com. https://www.theoccidentalobserver.net/wp-content/uploads/2018/06/TOO-Full-Logo-660x156-1.png 0 0 Cooper Sterling https://www.theoccidentalobserver.net/wp-content/uploads/2018/06/TOO-Full-Logo-660x156-1.png Cooper Sterling2011-10-01 09:29:482011-10-03 10:04:06National Suicide: Review of Pat Buchanan’s "Suicide of a Superpower"